Of all the glaciers in retreat throughout the world, those in this part of South America are the most likely to disappear first. Scientists call them the tropical glaciers, ice caps found in places as warm as Ecuador and Indonesia, where high mountain peaks have shielded them for thousands of years from the heat of the jungle below. Yet now, even these high perches have become precarious. Climate scientists say the ice cap here has been reduced by nearly a quarter in the past 40 years because of rising temperatures. With the rate of melting increasing each year, some scientists predict that within 50 years many of the peaks here will no longer have glaciers. On his many journeys, Mr. González has spent decades looking over the shoulders of scientists like Mr. Cochachin, shaping his own intimate view of a landscape altered by climate change. He watched the expanding rocky fields around the Pastoruri Glacier, where the melting ice uncovered fossils that had not seen daylight in ages, including those of ferns and other plants. He has seen rivers turn red as other glaciers melted and exposed heavy metals that poison the water downstream. “If there is no water, there is no life,” Mr. González said. His work begins early, well before sunrise, when he packs crampons used to walk atop the glaciers, large boring drills and topographical instruments, helmets, gloves and the gear to build a shelter, all in a backpack nearly as large as he is. The food often goes on a mule — provided the mule can make the climb. If not, Mr. González carries that, too, on several trips in and out of the camp over the course of several days. Americo González Caldua, right, using a heavy drilling auger that bores core samples deep below the surface of the glaciers to reveal a picture of the atmosphere from a century ago. Mr. González said the path on a recent climb to a glacier called Yanamarey would not be so taxing, by his standards — a round-trip journey of 10 hours. 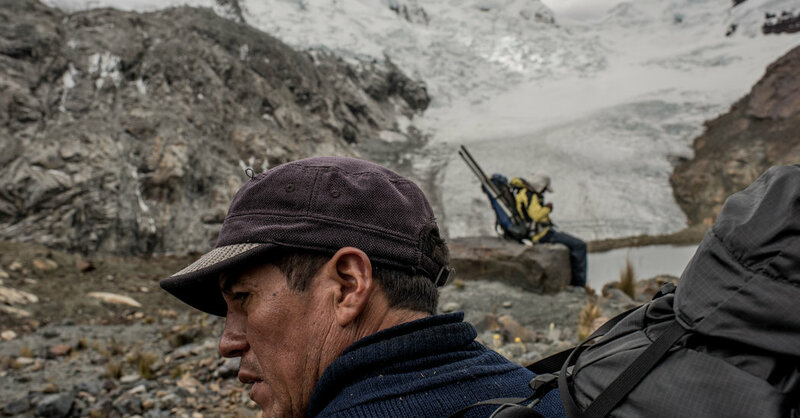 And so we headed out one morning with Rolando Cruz, a researcher in the nearby town of Huaraz who came to take some measurements at the base of the glacier. The long hours up are often quiet ones, where Mr. González searches for what he calls the “perfect route” through the unmarked boggy landscape of mist and fog where jagged peaks rise up on either side and hawks soar above. Vast plains stretch for miles, former lake beds from the ice age, where cows graze. “The cows weren’t here before,” noted Mr. González, saying they now graze at higher altitudes than before, as they follow the grasses as the temperatures have warmed. The route was one that Mr. González has crossed countless times over the decades, since he first visited the Yanamarey glacier in the early 1990s. His descriptions of it from that time vary. At times he evokes a building — it had “blue walls,” he said. Sometimes he spoke of the glacier’s “beautiful long tongue,” and it sounded more like an animal. “Yes, it is alive,” he said, describing the glacier’s slow movement below his feet. In the 1990s, the hikes could be an escape from the conflicts taking place below, when the Shining Path, the Maoist rebel group that terrorized Peru for decades, attacked politicians in Huaraz and planted three car bombs. Despite the unrest, American researchers would come each year, and Mr. González would lead them up as the ice sheet continued to melt. “When you go out into the field, your mind clears,” he said. It was the sound of the cracking, heard on nearly every ice sheet the scientists came to study, that bothered him most. “Tac,” he said, “like a huge sound.” And every year he came, Yanamarey was farther away than it had been the last time. Mr. González taking a break during the four-hour trek back to base camp after working on the Gueshgue glacier. Our climb continued. The landscape turned into a rocky stretch of boulders. Then the glacier came into view. It looked very different that day from the place Mr. González had described. The ice sheet, having once spilled into the lake below it, had retreated halfway up a rocky mountainside, a small spit peeking behind the rocks. There were no “blue walls,” no “tongue,” just a thin coat of ice over a bare rocky stretch. “It looks gray, like the color of lead,” Mr. González said several times. Mr. Cruz climbed up, took his measurements in the distance and returned some time later. The two men looked at each other with the same resigned glance, then headed back down the hill. At his age, Mr. González knows these journeys will not continue forever. His knees have begun to give out, particularly as he walks downhill with large amounts of gear. “You don’t have the same strength,” he said. Mr. González looked over at his son Álvaro, an 18-year-old who had joined us that afternoon back at the hostel in Huaraz. The boy told me he would soon study climate science in college, inspired by his father who had taken him to see the ice sheet for the first time some years ago. Who had shown Mr. González the glaciers first? It was his mother, he said, on a chilly day when the two were looking out at the peaks from a nearby farm. Back then, the ice seemed as permanent as the mountains themselves.